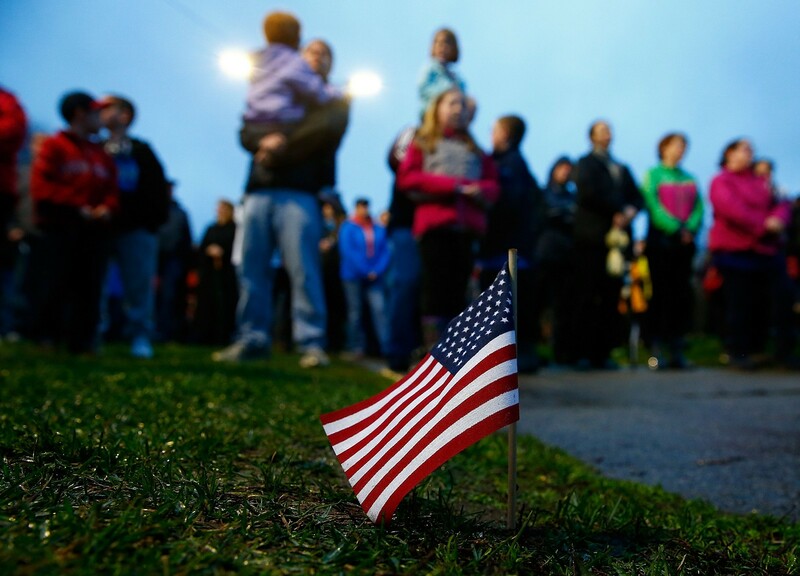 BOSTON - US Vice President Joe Biden, local leaders and officials and survivors of the Boston Marathon bombing shared messages of thanks and defiance on Tuesday at a tribute to the three people killed and 264 wounded in the attack exactly one year ago. 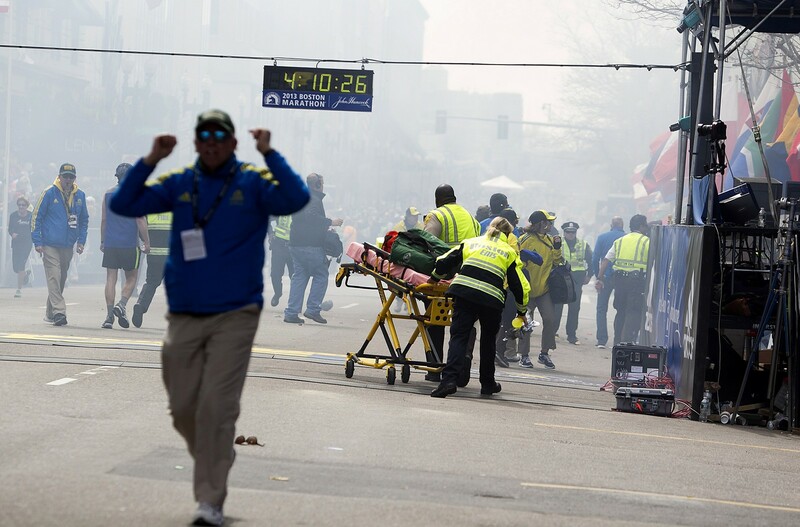 From Patrick Downes, who lost a leg when a pair of homemade bombs ripped through the crowd at the race's finish line, to Biden, speakers recalled how police officers, spectators and others on the scene reacted immediately to help the wounded amid the chaos on April 15, 2013. Former Boston Mayor Thomas Menino, who managed the response to the attack during the final year of his two decades in office, recalled the struggles of the families of Martin Richard, 8, Krystle Campbell, 29, and Chinese national Lu Lingzi, 23, who died in the largest mass-casualty attack on US soil since September 11, 2001. 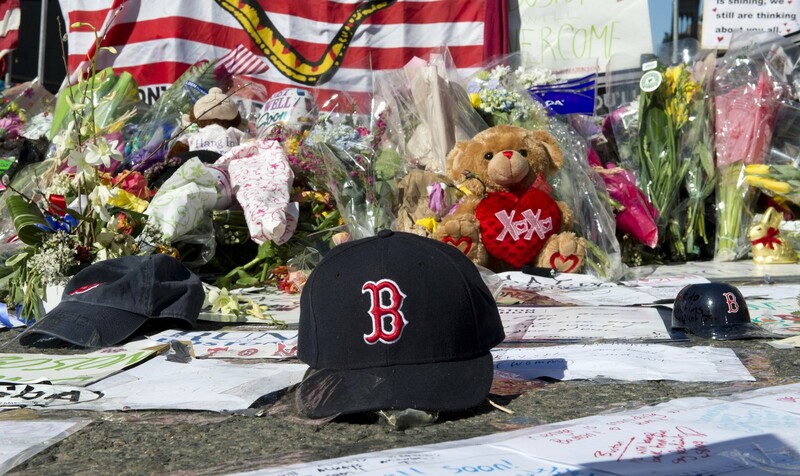 "You have struggled to get through the good days and the bad," said Menino, who had been hospitalized at the time of the blasts but responded to the scene against his doctor's orders. "I know because so many of you have told me about this year of firsts. First birthday without your beloved son, first holiday without your daughter, first July 4 where the fireworks scared you." 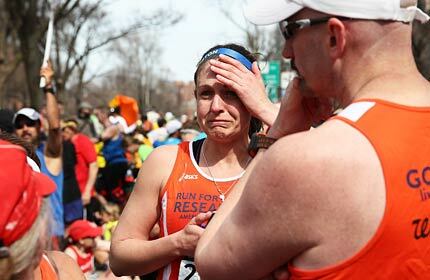 Downes, who had been standing near the finish line with his wife when the bombs went off, causing each to lose a leg, told the crowd of about 2,500 people that he had been impressed by the city's outpouring of support for the wounded. "We would never wish the devastation and pain we have experienced on any of you," Downes said. "However, we do wish that all of you, at some point in your lives, feel as loved as we have every day of this past year." 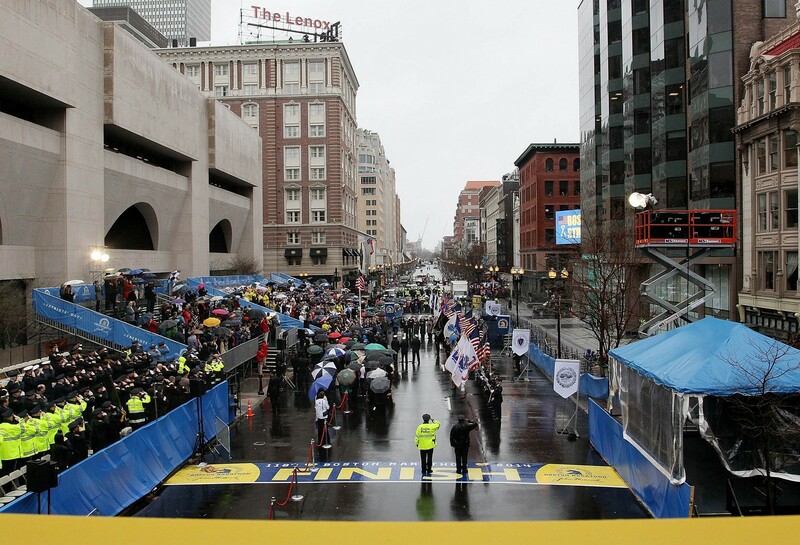 Following the ceremony, the crowd walked down Boylston Street, the final stretch of the marathon, in heavy rain and high winds to watch officials raise an American flag at the finish line. At 2:49 p.m. EDT (1849 GMT), the time the first bomb went off, the city observed a moment of silence. Afterwards, churches throughout Boston tolled their bells and ships in the city's harbour sounded their horns. 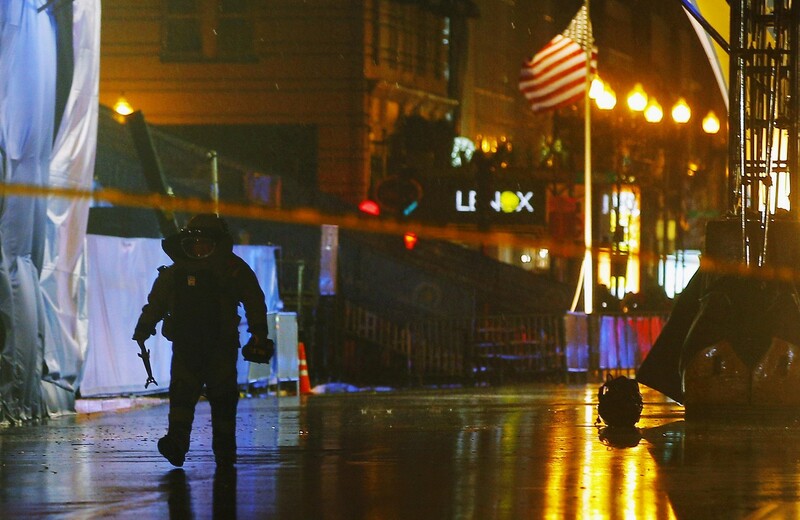 A member of the police bomb squad (L) walks away from a bag (R) left on the road near the finish line of the Boston Marathon in Boston, Massachusetts April 15, 2014, during the one year anniversary of the 2013 Boston Marathon bombings. 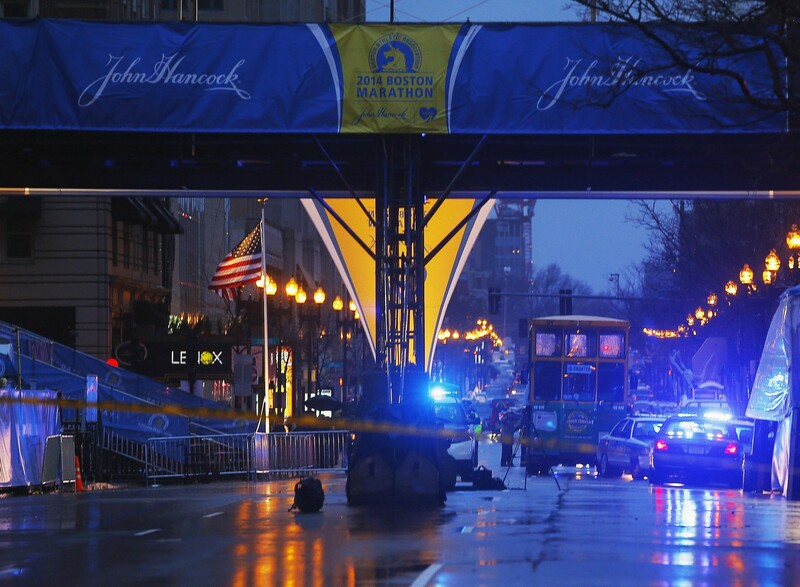 The Boston Police Department late on Tuesday reported that two backpacks were found near the race's finish line and were being inspected by the bomb squad. Hundreds of people were evacuated after the backpacks were found at the scene of the twin bombings that killed three people exactly a year ago. One of the bags was later detonated by the bomb squad after inspection, reported local media. 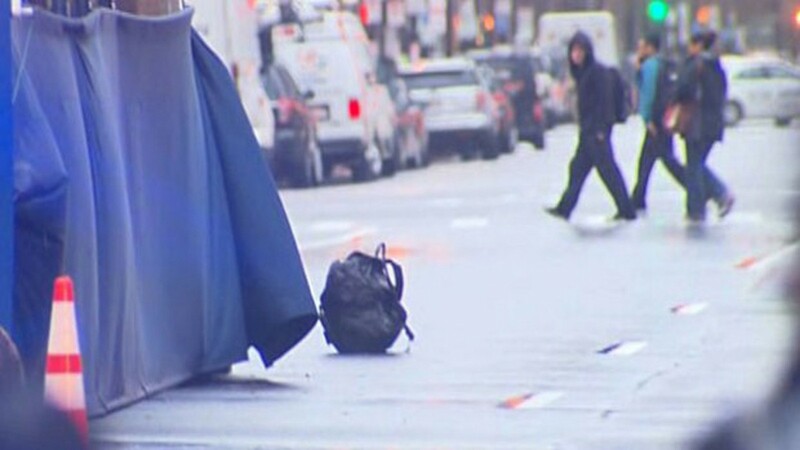 The Boston Police Department wrote on its official Twitter account that a male suspect had been taken into custody in connection with the unattended backpacks. 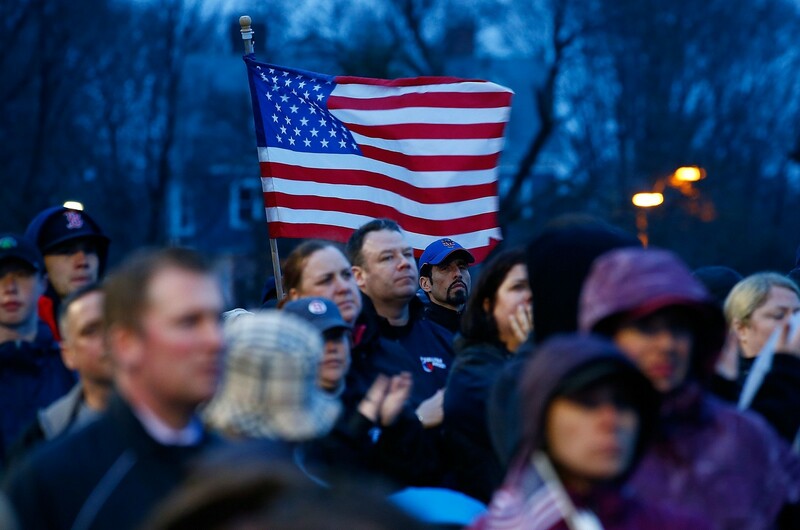 Boston earlier paid solemn tribute to the victims and survivors of the April 15, 2013 marathon bombings, observing a moment of silence and raising the US flag exactly one year after the attacks. 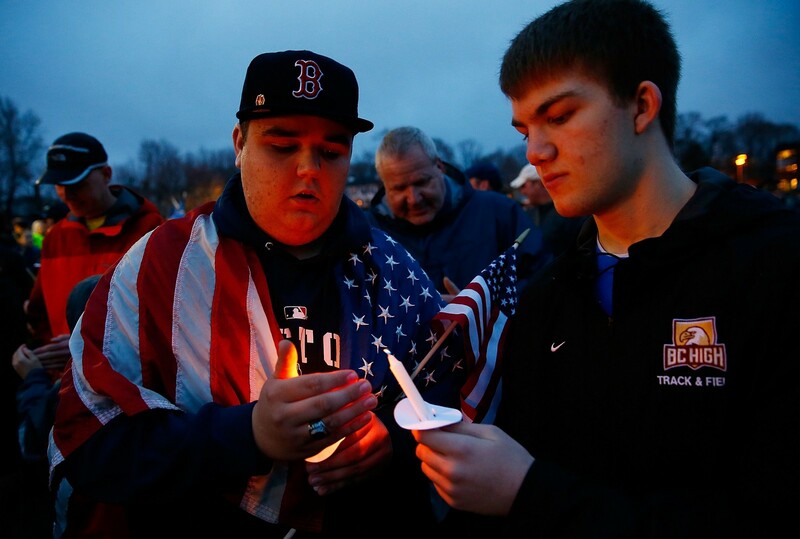 Two Dorchester residents light their candles during the candlelight vigil for the one-year anniversary of the Boston Marathon bombings at Garvey Park on April 15, 2014 in Boston, Massachusetts. 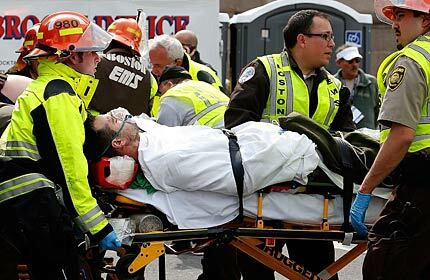 Last year, two pressure cooker bombs killed three and injured an estimated 264 others during the Boston marathon, on April 15, 2013. 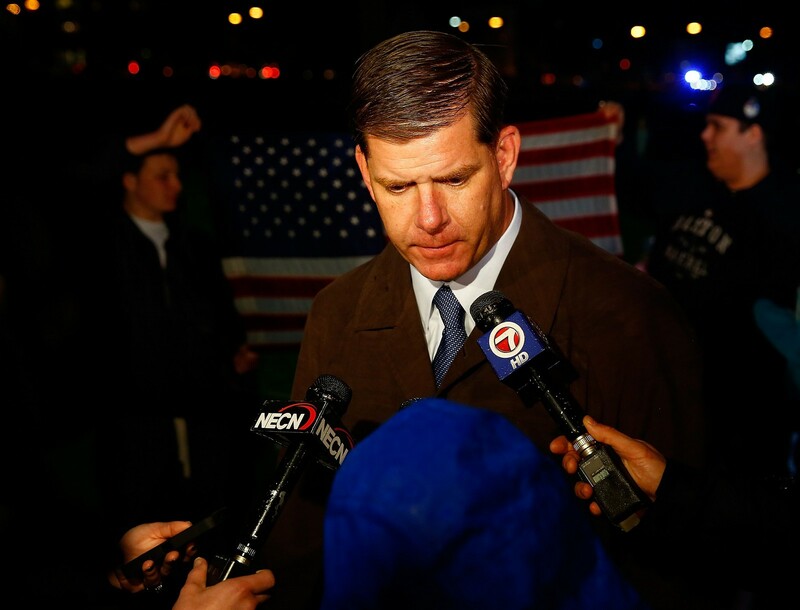 Boston mayor Marty Walsh speaks with reporters following a candlelight vigil for the one-year anniversary of the Boston Marathon bombings at Garvey Park on April 15, 2014 in Boston, Massachusetts. 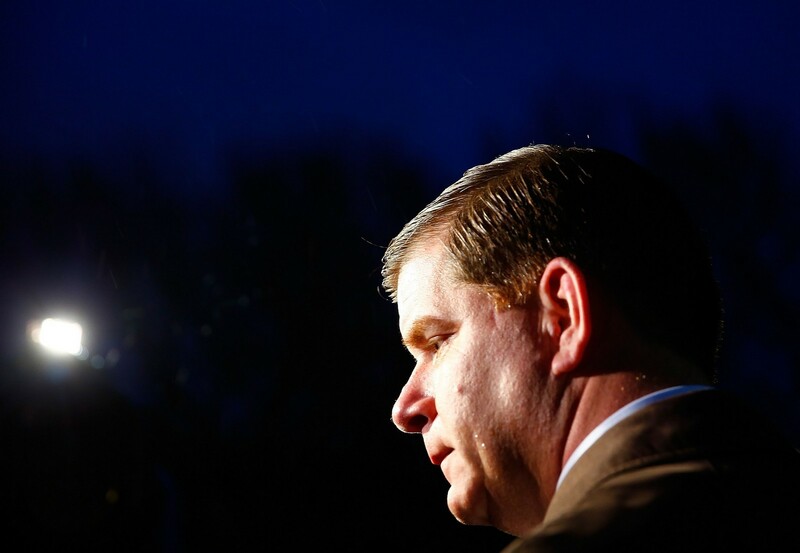 Boston Mayor Marty Walsh spoke Tuesday at the tribute to victims and survivors of last year's bombing. 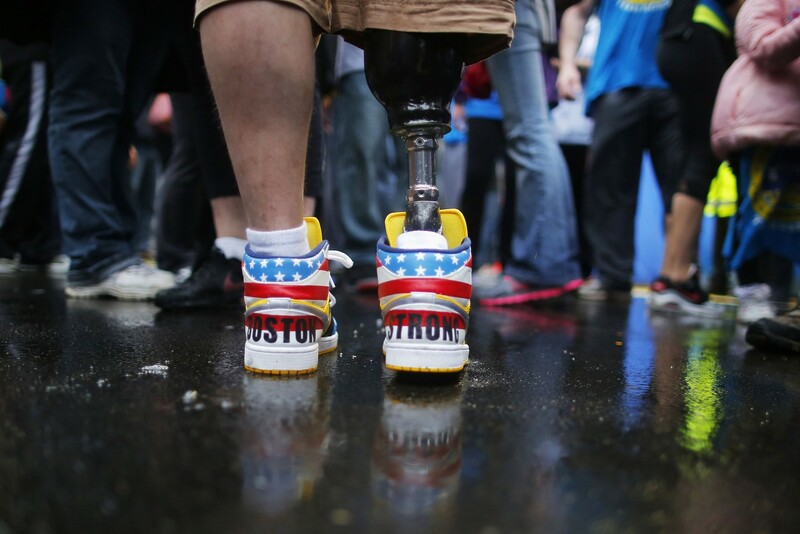 The shoes of 2013 Boston Marathon bombing survivor J.P. Norden read "Boston Strong" as he stands at the finish line on the one-year anniversary of the bombings in Boston, Massachusetts April 15, 2014. 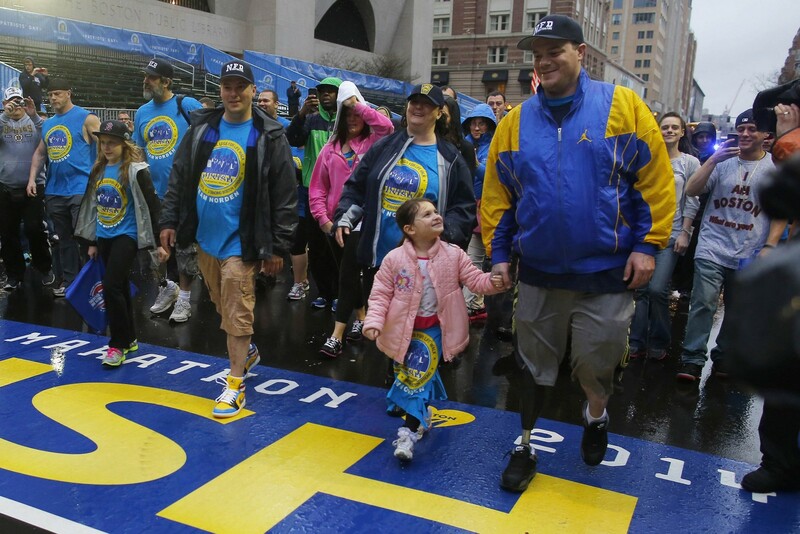 Boston Marathon bombing survivors Paul (C) and J.P. Norden (R) cross the finish line on the one-year anniversary of the bombings in Boston, Massachusetts April 15, 2014. 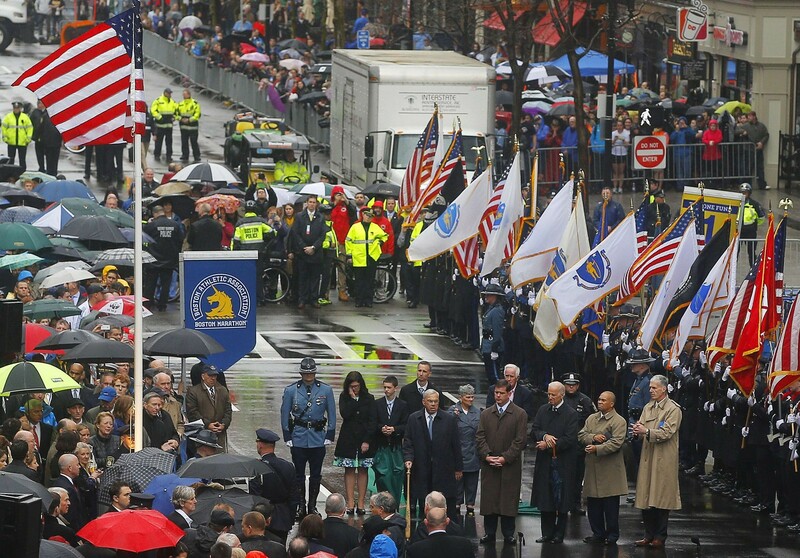 Dignitaries, including U.S. Vice President Joe Biden, survivors and first responders participate in a flag raising ceremony at the finish line in Boston, Massachusetts April 15, 2014, on the one-year anniversary of the 2013 Boston Marathon bombings. 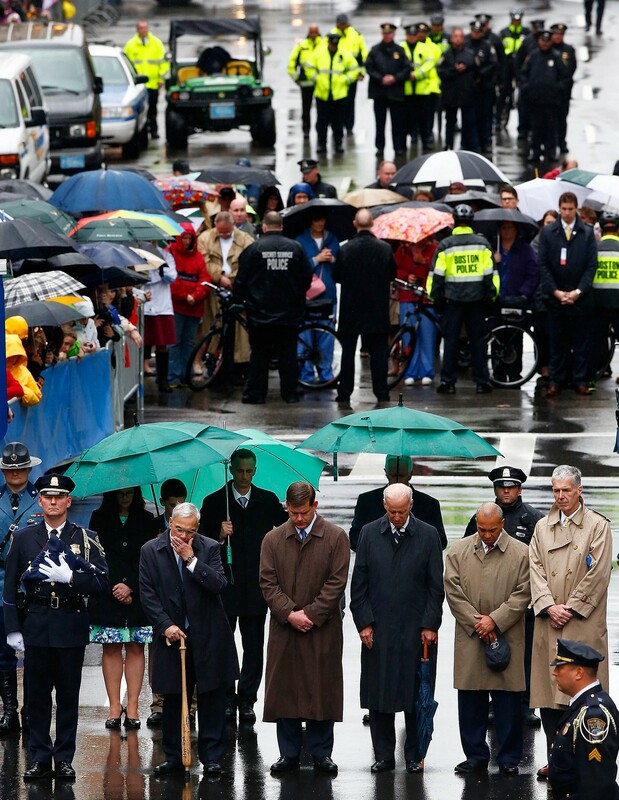 Biden, other leaders and survivors of the Boston Marathon bombing shared messages of thanks and defiance on Tuesday at a tribute to the three people killed and 264 wounded in the attack exactly one year ago. 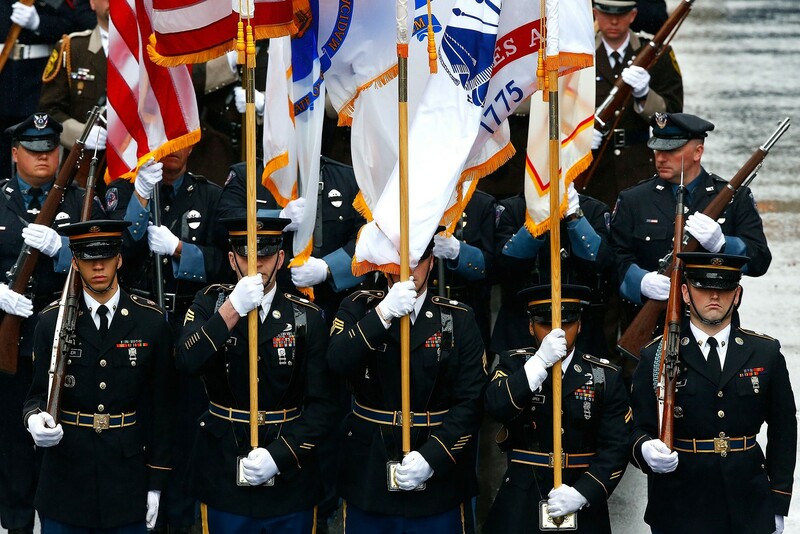 Boston area police and fire department flag bearers get into formation during the flag raising ceremony commemorating the one-year anniversary of the Boston Marathon bombings on Boylston Street. 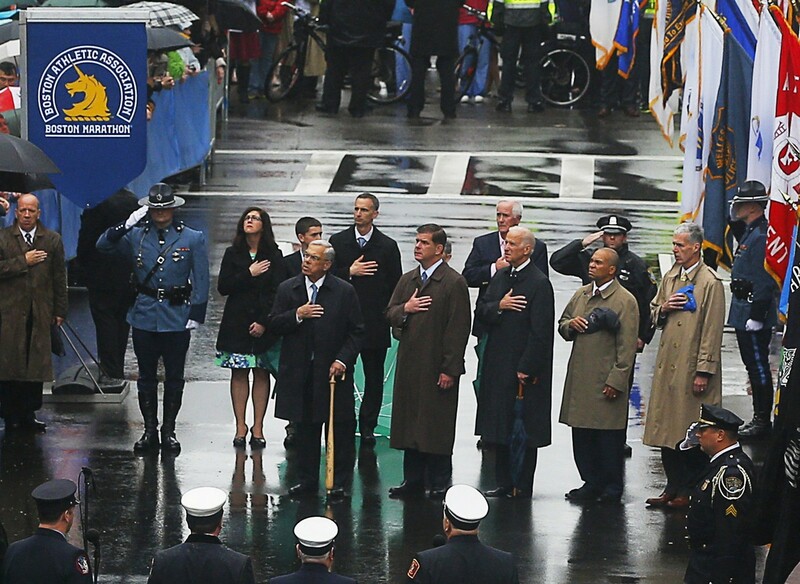 Former Boston mayor Thomas Menino, mayor Marty Walsh, U.S. Vice President Joe Biden, Governor Deval Patrick, and Tom Grilk, Executive Director, Boston Athletic Association stand together with members of the victims families during the flag raising ceremony. 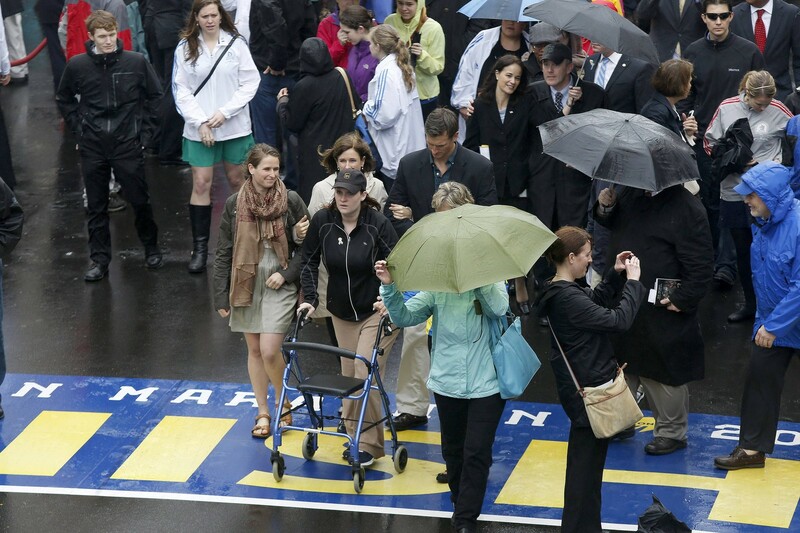 A woman crosses the finish line while using a walker following the flag raising ceremony commemorating the one-year anniversary of the Boston Marathon bombings on Boylston Street near the finish line on April 15, 2014 in Boston, Massachusetts. 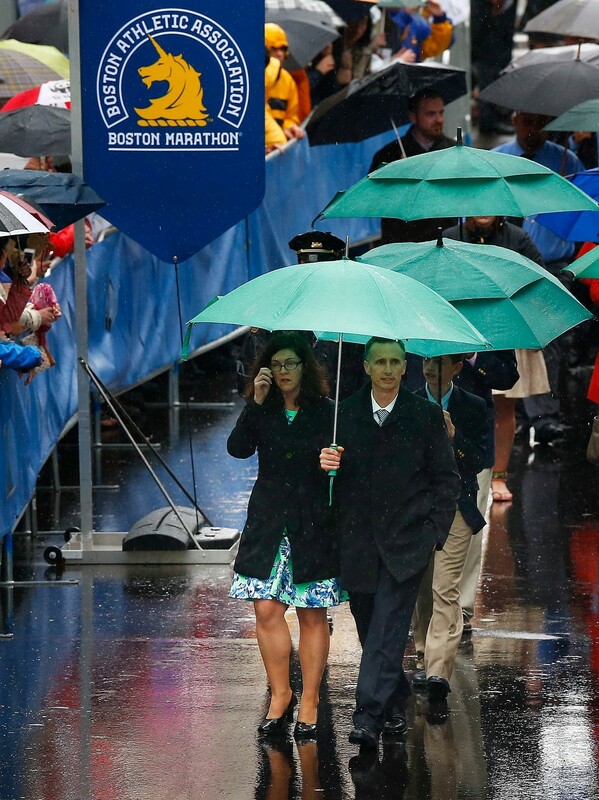 Bill and Denise Richard, parents of Martin Richard, who was killed in the Boston Marathon bombings, walk along Boylston Street in the rain during the flag raising ceremony commemorating the one-year anniversary of the bombings on Boylston Street near the finish line. 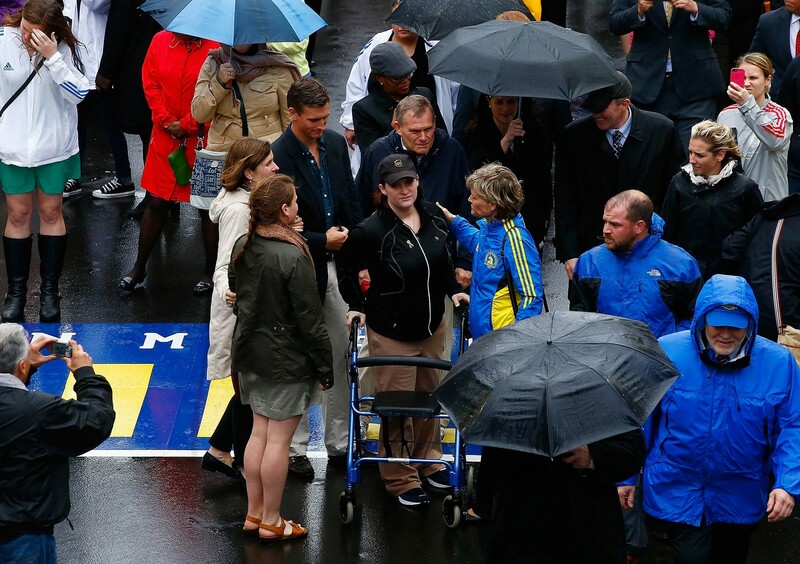 Denise Richard (C), mother of Boston Marathon bombing victim Martin Richard, holds her face along side dignitaries, survivors and first responders during a ceremony at the finish line. 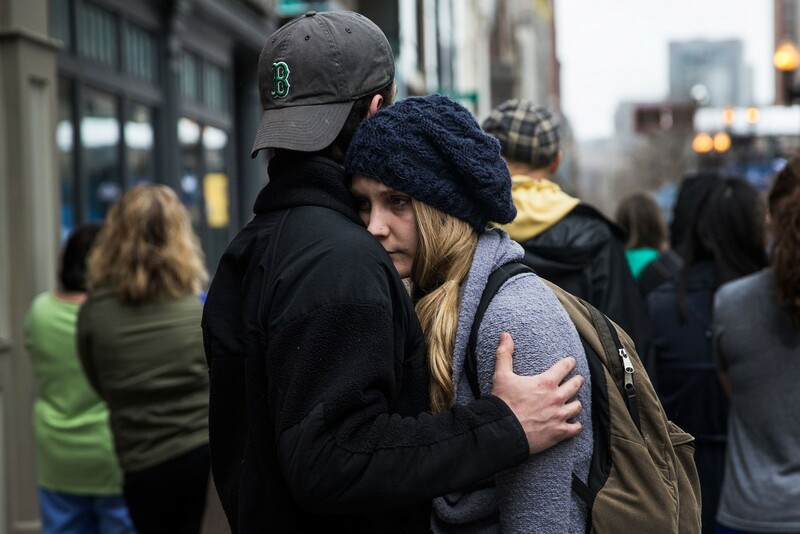 Tom Duggan hugs Sarah Rogo, who said they were both present last year at the marathon, while a billboard television screen broadcasts the ceremony commemorating the one year anniversary of the 2013 Boston Marathon Bombing. 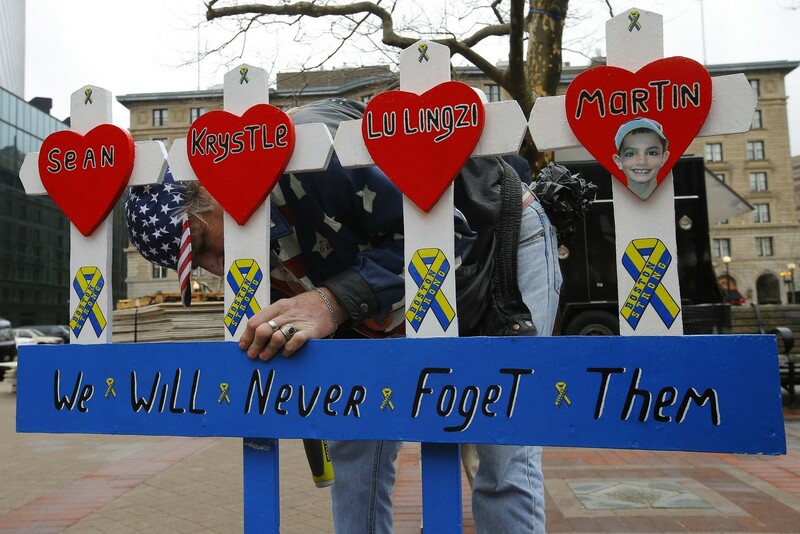 Kevin Brown puts up a hand made memorial for victims of the 2013 Boston Marathon bombings near the race's finish line in Boston. 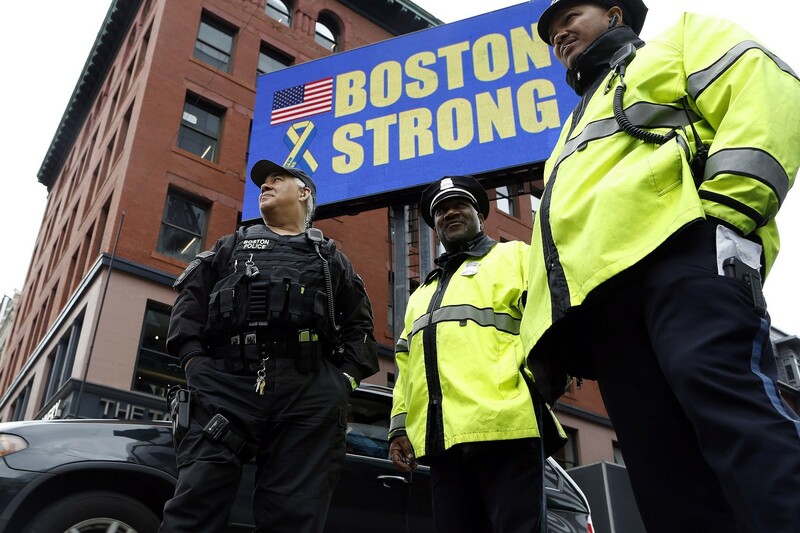 Boston Police stand beneath a Boston Strong sign near the site of one of the two bomb blasts on the one-year anniversary of the 2013 Boston Marathon bombings in Boston. 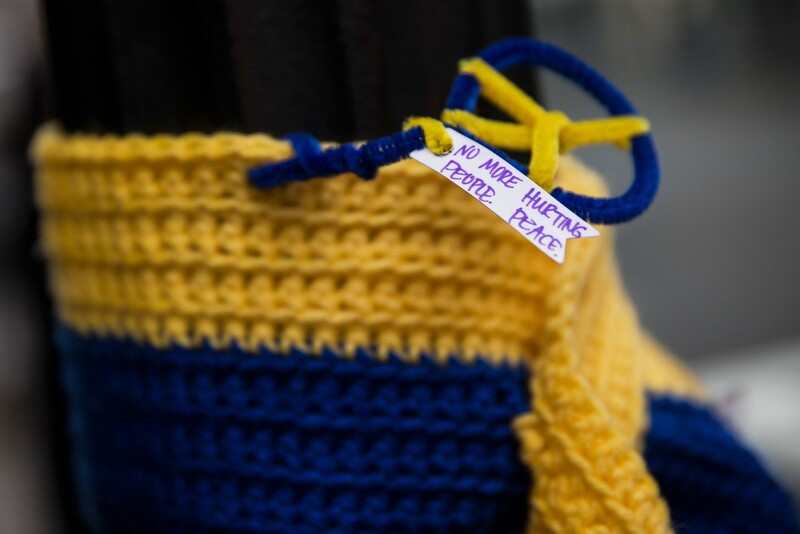 A knitted tribute hangs on a street light along the course of the Boston Marathon on the one year anniversary of the 2013 Boston Marathon Bombing. 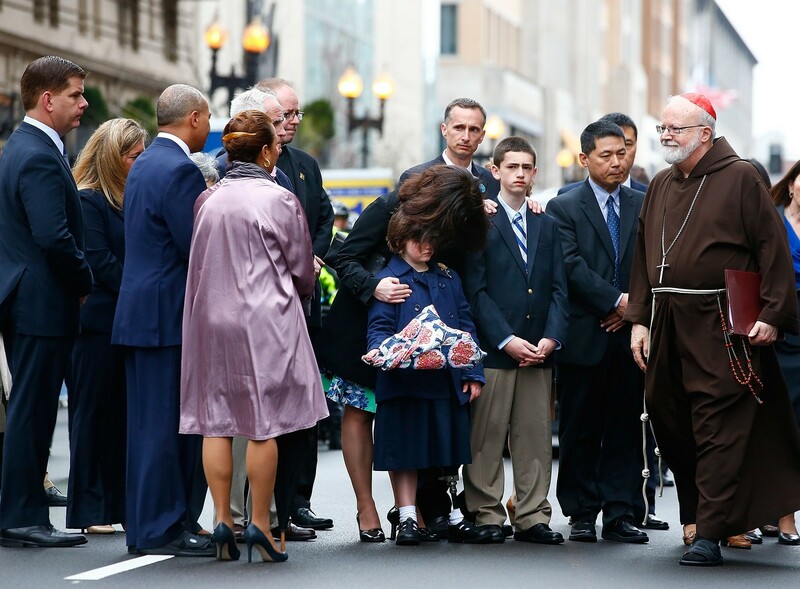 Massachusetts Governor Deval Patrick and Cardinal Sean Patrick O'Malley greet members of the victims families during a wreath-laying ceremony. 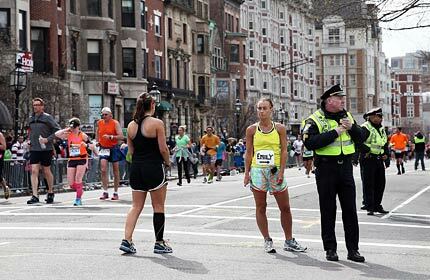 Last year, officials stopped the race after two pressure cooker bombs exploded near the finish line, killing three people and injuring more than 260. 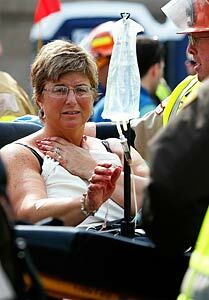 Two simultaneous explosions ripped through the crowd at the finish line of the Boston Marathon in April 2013. 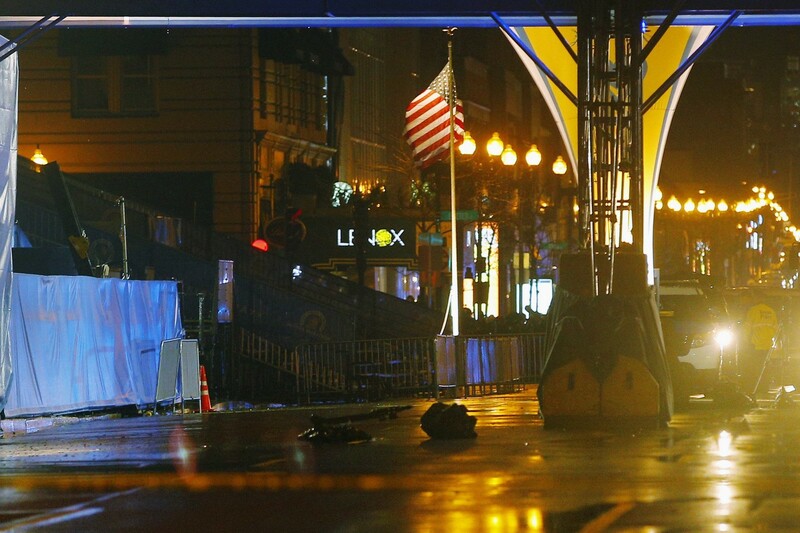 The two explosions at the finish line of the world famous Boston marathon killed at least two people and injured dozens more. 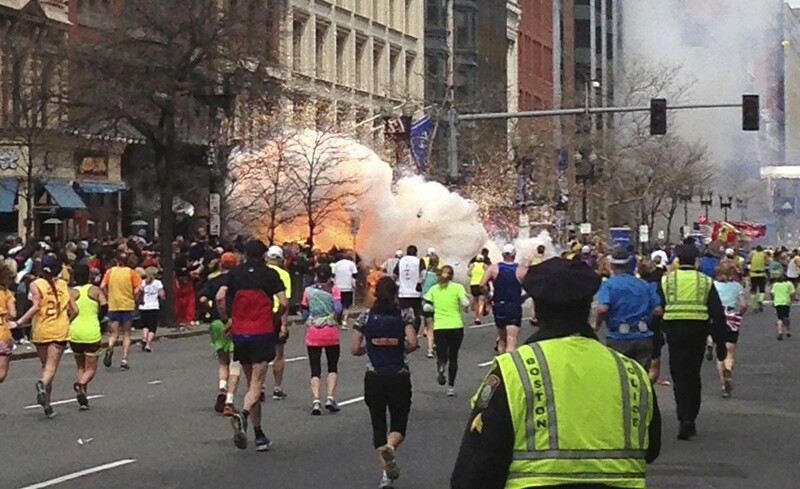 This video still captured by NBC shows one of the explosive devices detonating in the bystanders' area. 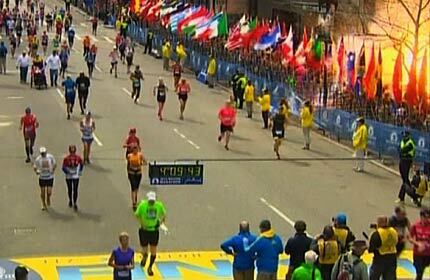 Tens of thousands of people had packed the streets to watch the race, which was flagged off about five hours prior to the explosions. 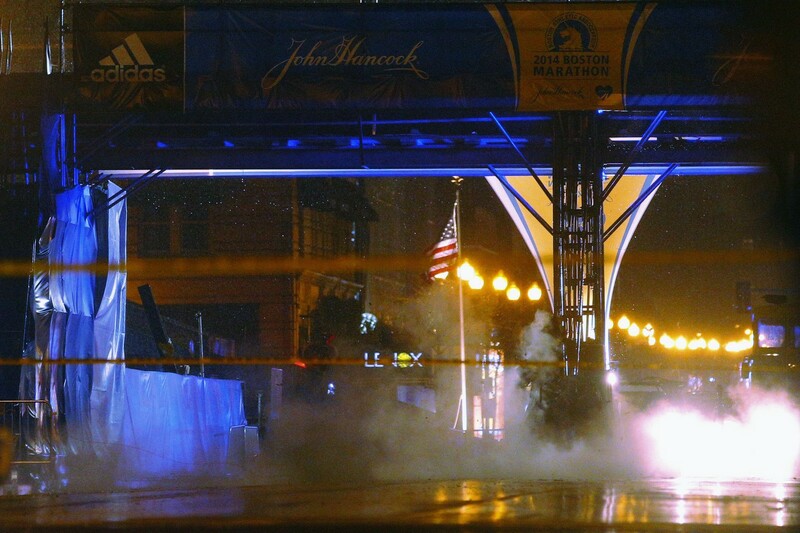 Many runners were heading for the finish when a fireball and smoke rose from behind cheering spectators. 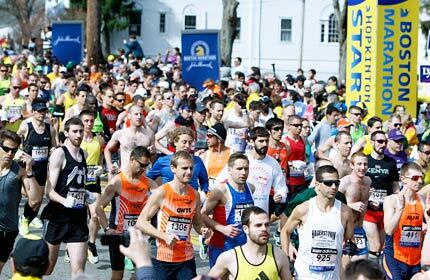 The Boston Marathon has been held on Patriots Day, the third Monday of April, since 1897. 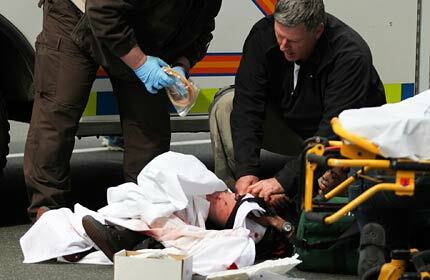 Medics tending to an injured woman at the scene. 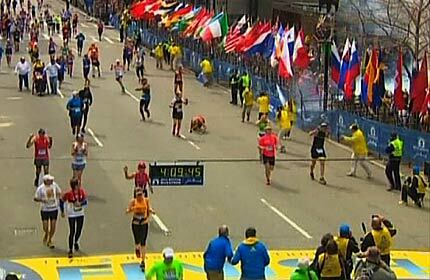 The two explosions were about 50 to 100 yards (meters) apart as runners crossed the finish line with a timer showing 4 hours and 9 minutes. 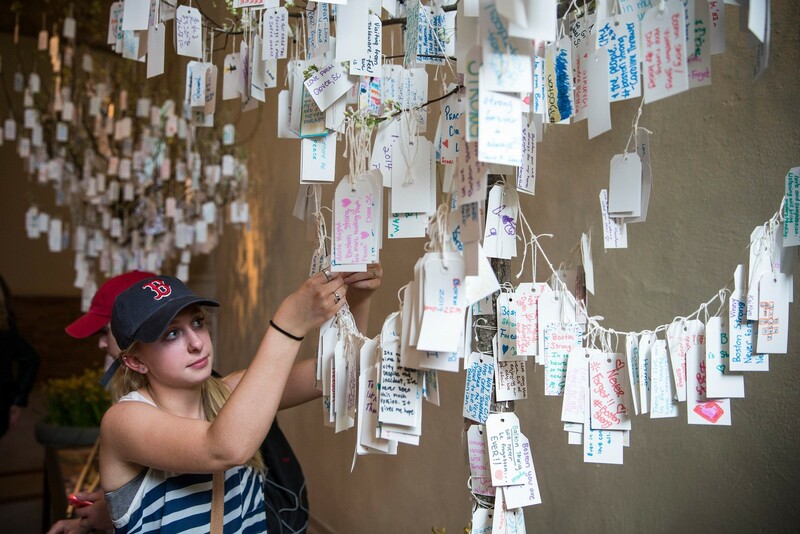 Kathryn Shea, from Rochester, New York, hangs a hand-written message she wrote on a tree hung with messages inside a display titled, "Dear Boston: Messages from the Marathon Memorial" in the Boston Public Library to commemorate the 2013 Boston Maraton bombings. Hand written messages are displayed in an exhibit titled, "Dear Boston: Messages from the Marathon Memorial" in the Boston Public Library to commemorate the 2013 Boston Maraton bombings, on April 14, 2014 in Boston, Massachusetts. 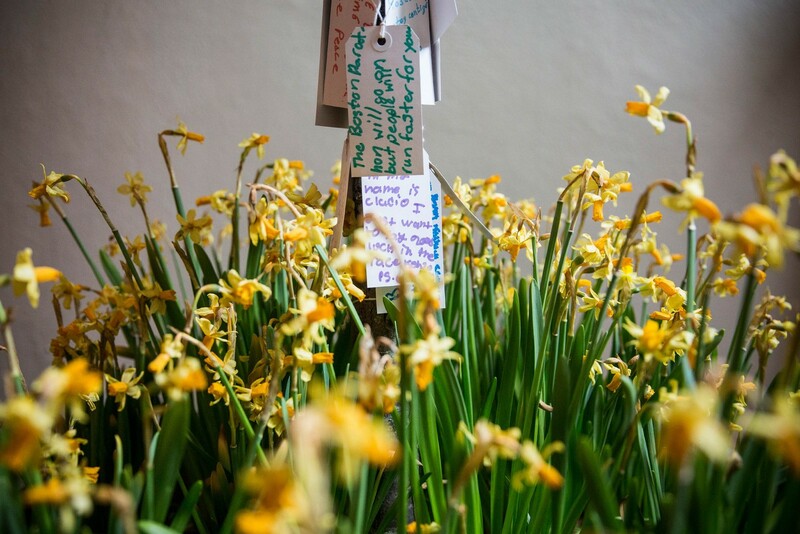 A runner's shoes read, "I will run the Boston Marathong for you," in a display titled, "Dear Boston: Messages from the Marathon Memorial" in the Boston Public Library to commemorate the 2013 Boston Maraton bombings.